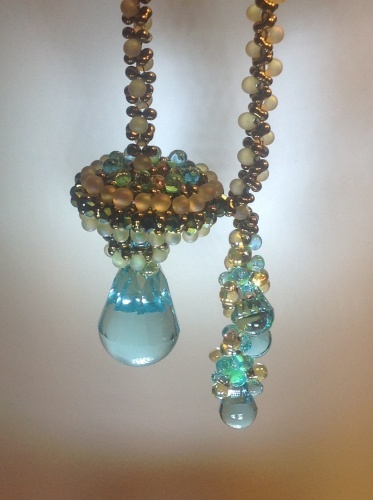 Peanut beads and Japanese drop beads combine in a most intriguing way to make the chain of this necklace. Deceptively simple yet complex in appearance. At one end, attach half of a magnetic clasp. Stitch an elegant ring of drops and crystals to adorn the other end of the chain. Add a cascading counterweight of drops and small crystal cabochettes. Make a focal element of a large cabochette, lavishly beaded with drop and peanut beads to conceal the other half of the magnetic clasp. When it is completed, drop the magnetic end of the chain through the ring on the far end. Attach the magnetized cabochette, now capped by the ring of beads. Enjoy learning these techniques that pair peanut and drop beads while composing a fun necklace.